6 Abdominal Exercises: to regain good strength & control of your abdominal muscles! Are you fit for Zero Pressure Gymnastic? Check the scar of c-section if there is one, it should be perfectly healed before starting to exercise. If it’s ok, your transverse muscle is competent and you can start “zero pressure gymnastic“. Breathe out with your mouth and pull gently your tummy in as if you wanted to fit into tight jeans and hold a pelvic floor contraction in the same time. Breathe out through your mouth and pull gently your tummy in as if you wanted to fit into tight jeans and hold a pelvic floor contraction in the same time. To create a synergy between transverse muscle and pelvic floor muscles. This synergy prevents an increase of intra abdominal pressure which push on your pelvic floor leading to its weakening and issues such as incontinence and prolapse. For more details have a look at our articles on prolapse and incontinence or our video about Sport to Do or to Avoid in Pregnancy! Zero pressure gymnastic is difficult to understand and to perform at first as it require a good awareness and control of abdominal, diaphragm and pelvic floor muscles. To be sure to perform these exercises correctly do not hesitate to ask to your Woman’s health physiotherapist! As usual don’t hesitate if you have any question! Congratulations on writing about low pressure exercises. The exercises described are not zero pressure, are low pressure. 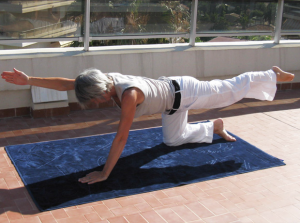 They are exercises that come from yoga, Uddiyana Bandha. If you add myofascial stretches, neurodynamics, postural and respiratory techniques, an updated methodology and didactics, you will get something much more updated, Low Pressure Fitness (see the website). Regards. Thank you for your comment. Actually, these exercises come from hypopressive gymnastique (French name). They were developed in the 80s by Marcel Caufriez (http://www.marcel-caufriez.net/fr/) and Bernadette De Gasquet (http://www.degasquet.com/). The last one is a Yoga teacher she probably was inspired by Yoga exercises. As mentioned, it is a difficult gymnastic and we don’t intent to give all the details just a quick introduction. We aim both to present briefly this gymnastic and also help our patients to remember exercises we give them. DO YOU WANT CLIENT TO HOLD THERE BREATH AS THEY HOKD THR CONNECTION 12 to 15 seconds or do you want them to breath normally as they hold ? Would they not then need to breath more thoracically (probably would do this sub consciously ) . Thank you i look firwards to hearing from you . It is an apnea, so yes patients need to hold their breath.